What do these two methods do? * Draws a cuboid that has its texture always be "seamless"
Is your model registered at startup? 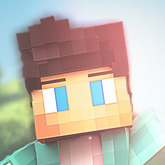 I think your texture files are maybe at the wrong location. They should be in assets/bnha/textures/models. They are at the wrong location. 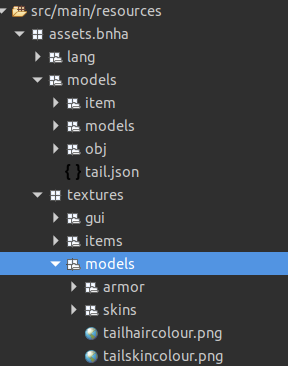 The json file just searches in your models folder not in models/skins. Yeah i was too fast and saw it right after clicking submit reply... Maybe try if vanilla minecraft textures are working. I just tried your model as a regular item and it's showing perfectly. So the json seems fine. I mean when i load your model for my item it shows with texture. So something in your code seems wrong. The textures just haven't been loaded. I don't know the exact procedure here, but you'd probably need to load them in during the TextureStitchEvent. @Corey thank you very much this was the solution! btw this is the code i used to register the textures!